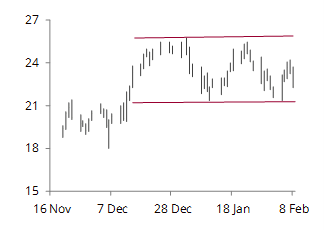 EUAs continued to trade steadfastly in a 21.4–25.7 €/t technical range last week, closing Friday in the lower part of the range but posting an 1.7% w/w gain. While there was no surprise in that technical trading range, it was a very soft week for the related fuels complex. The EU natural gas market has continued to be weak, as storage levels remain high and supply continues to be complimented by incremental LNG washing in from a well-supplied global market. 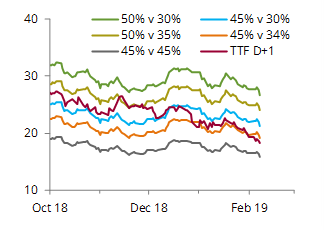 The TTF has been trading, particularly for delivery in summer 2019, at a much lower fuel switch trigger than seen in previous years. The market is now pricing in gas-fired plants that are just 5% more efficient than coal-fired units, compared to previously pricing in gas plants that are 15% more efficient. 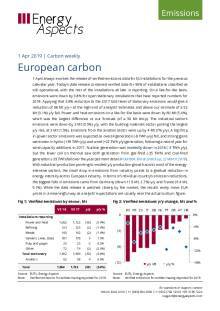 Underlying emissions reductions are likely to be around 35 Mt y/y over April-September, with the gas market now trading at a level that we expect will deliver much of the available coal-to-gas switch for summer 2019. 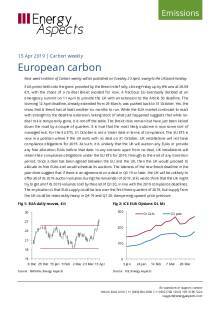 With the forward summer markets also at that lower fuel switch trigger price for Sum-20, the drop in annual compliance demand will be matched by a reduction in demand for EUAs to create future hedges. Last week’s surprise came from the coal market. Cif ARA had traded around 80 $/t since the start of the year, a level that was largely consistent with a 60 $/bbl oil price. While oil held its value last week (4-10 February), the weak bids for coal coming from the increased fuel switch to gas meant that coal broke away from its oil price anchor and started to compete for market share. Over the last two days, coal fell by 8% to close Friday at 72.8 $/t. This was a cue for gas to drop further, with the TTF falling and still closing at its 5% fuel switch trigger. This looks like a potential race to the bottom between the two fuels, raising the question of whether the market will retain its consensus that the only way is up for EUAs. With the fuel switch coming into the market regardless of the EUA price, will the ‘buy and holds’ retain their conviction that this is a market with gains still to come? In looking at more immediate price action, EUAs are awaiting a trigger to push them out of the 21.4–25.7 €/t range. The risk of a no-deal Brexit looks set to persist through the remainder of February. Indications are that Theresa May is only likely to resubmit to the UK parliament in March a slightly tweaked version of the previously heavily rejected Brexit deal. With Brexit risk likely to rule out an upwards break from EUAs, market focus should turn to a downside break given the increasingly bearish outlook for the fuels complex. With much speculative capital taking its consensus view from the fuel switch price, and lower gas prices having now put paid to fuel switching providing any upside to carbon, now could be the time to take profit on long outright EUA positions. If the drop in the fuels complex shatters that bullish EUA consensus, this could be the trigger for a sell-off. With Brexit risk still on the table and there being a high likelihood that EUAs will get sold off hard by funds and banks if the UK crashes out of the EU without a deal, the risks of holding EUAs is growing. We expect a no-deal Brexit would likely push EUAs down by at least 10 €/t, as that political event would be a significant risk-off signal for any European asset. We have recently been bullish EUAs for 2019, but our conviction that there will be another trend move upwards is starting to be sorely tested. Much of the upside potential that remains for EUAs this summer is from an expectation that speculative capital will return to the market on some form of Brexit deal. However, the failure in January to see EUAs move higher might have started to erode some of the market’s bullish conviction, which might just evaporate more fully when we factor in some 48 Mt of added Norwegian EUA sales and high levels of coal-to-gas switching. With fuels falling in price, expect carbon to test downside support this week.